CANNES, France—Y&R New Zealand's cheeky recipe for the "McWhopper"—a sandwich that Burger King proposed to collaborate on with McDonald's, but which didn't actually happen—won the Grand Prix in the Print & Publishing competition at the Cannes Lions Festival here tonight. Last August, BK purchased a full-page ad in The New York Times and the Chicago Tribune, inviting McDonald's to create the cross-brand burger in honor of Peace Day on Sept. 21. "We know we've had our petty differences," the copy said, "but how about we call a ceasefire on these so called 'burger wars'? 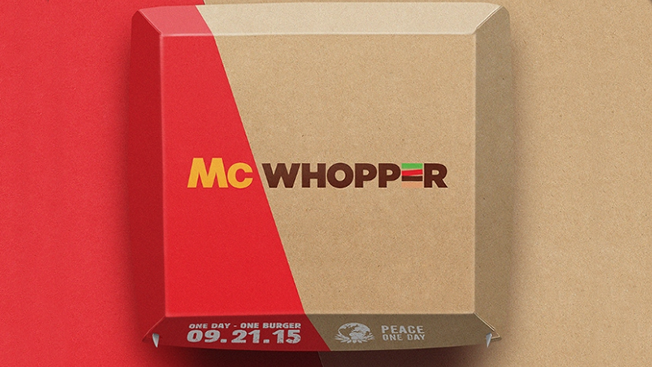 … We'd like to propose a one-off collaboration between Burger King and McDonald's to create something special—something that gets the world talking about Peace Day. The McWhopper. All the tastiest bits of your Big Mac and our Whopper, united in one delicious, peace-loving burger." BK suggested selling the item for one day only (Sept. 21) in one location, with all proceeds benefiting nonprofit group Peace One Day. The ad concluded with the line, "Let's end the beef, with beef." BK agencies Code & Theory, Alison Brod Public Relations, David, Rock Orange, Turner Duckworth and Horizon contributed to the effort, which captured the public's attention and generated scads of publicity. In April, the campaign won the Grandy, the highest honor at the International Andy Awards, and Y&R staffers from around the globe celebrated by creating their own versions of the McWhopper and immortalizing their culinary efforts in a fun video. Like another Grand Prix winner tonight—REI's #OptOutside, which scored the top honor in Promo & Activation—"McWhopper" ranked among the campaigns favorited to win Lions at Cannes. Print & Publishing jury president Joji Jacob, group executive creative director at DDB Singapore, said he instructed the judges to look for print work that could pass a few simple tests. "We looked for a print ad that would keep me from sneaking a look at my smartphone every five minutes," he said. "Can a print ad engage us long enough to not look at our phones? The other thing was: Could a print ad be as engaging as my social media feeds? Does it tell me more than my Facebook feed, or my Twitter feed? If I put it on the internet, would it take off and become viral?" The winner passed both tests with flying colors. "It's a very simple piece of print work. But it's print work at its most powerful," Jacob said. "It was a piece of print which set off a whole chain of a marketing ecosystem. It's a print ad which was hijacked by the net, which is awesome. It got spoken about all over the world, and it became a viral sensation in itself." Jacob conceded that some other entries were better crafted, and better written. "But a single print ad that could get picked up by TV, that could get picked up by the internet—it was the idea behind it," he said. "And we think this is the future of print. It's not just an isolated piece. It's a piece that creates a conversation, and gets hijacked by the socially dominant media and starts spreading the word around. And it became the lynchpin of a massive campaign."